Within Saturn's infamous rings lies a gap  an opening within the orbiting particles of ice and rock that compose the planet's rings. It was here that scientists discovered a previously unknown moon, currently known as S/2005 S1, in the images sent back to Earth from Cassini less than a year after the spacecraft began orbiting Saturn. In a small space between Saturn's rings, known as the Keeler Gap, scientists have discovered a new moon, currently called S/2005 S1. The new moon is comparable to the small porous moon Pan, found in the Encke Gap. Image courtesy of NASA/JPL/SSI. Scientists are aware of about a dozen of these gaps between Saturn's rings, says Carolyn Porco, head of the Cassini imaging team at the Space Science Institute (SSI) in Boulder, Colo., and the gaps are formed by either "strong resonances with external moons or by small moons embedded in the gaps." The "Keeler Gap," which contains S/2005 S1, is 136,505 kilometers from the gaseous Saturn. The researchers had noted strange perturbations and wave motions in the ring particles near the Keeler Gap. They thus theorized that a moon's gravitational influences were responsible for making these waves, based on previous observations of the "Encke Gap," in which another of Saturn's moons, Pan, was found in 1990 by the Voyager mission. "These peculiar features also had a characteristic spacing that implied the perturbing moon had to be in the middle of the gap," Porco says. S/2005 S1 is about 7 kilometers (4 miles) in diameter, but its composition is still unknown. One way to determine the composition is by spectral observations and measuring density, says Randolph Kirk, a planetary geologist with the U.S. Geological Survey, and part of the Cassini Radar team that is currently monitoring Saturn's moon Titan, the only moon in the solar system known to have an atmosphere. Determining the density is not an easy task, however, and "generally requires a close spacecraft flyby to measure the mass," Kirk says. "Such a flyby isn't possible for a moon within the rings." This view of Saturn's moon Titan, the only moon known to have an atmosphere, was taken during the Cassini spacecraft's closest flyby of Titan on April 16, 2005. Image courtesy of NASA/JPL/SSI. Therefore, the team must estimate the mass by examining the size and shape of the waves created by the interactions between the ring particles and the moon, Porco says. "But the waves are complicated and so we can't say for sure how big they are," she says. "If I had to venture a guess, the density will be like the density of the moons like Atlas and Pan," which are porous and therefore, not very dense. Determining the density will help the scientists understand how S/2005 S1 formed and learn about its history. Scientists have several speculations as to how the moon formed, based on their limited information about S/2005 S1. It could possibly be a "remnant or collection of remnants of another larger moon around Saturn that was broken apart in a catastrophic collision with another object," Porco says, "or it might be the remnant of a large comet, from the outer solar system, that came close to Saturn, got torn asunder in the way that Comet Shoemaker-Levy 9 was torn apart, and the material got captured into orbit around Saturn." The Cassini-Huygens mission was developed to understand the various elements of Saturn, its rings and moons. 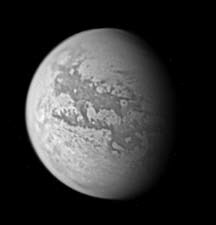 In January, the Huygens probe landed on Titan to measure the atmosphere there and determine if it is a possible analog to Earth's early atmosphere (see Geotimes Web Extra, January 2005). In a May 12 press release, scientists from the NASA Goddard Space Flight Center announced that Titan's atmosphere was 98 percent nitrogen and the rest methane. Both Cassini and Huygens will perform spectral mapping for high-quality images of Saturn, its rings and moons. Those images include more observations of the Keeler Gap with S/2005 S1 and other gaps during Cassini's orbits, to better understand this new moon and to see how many more moons are hiding within Saturn's rings. "I predict we will find more," Porco says.